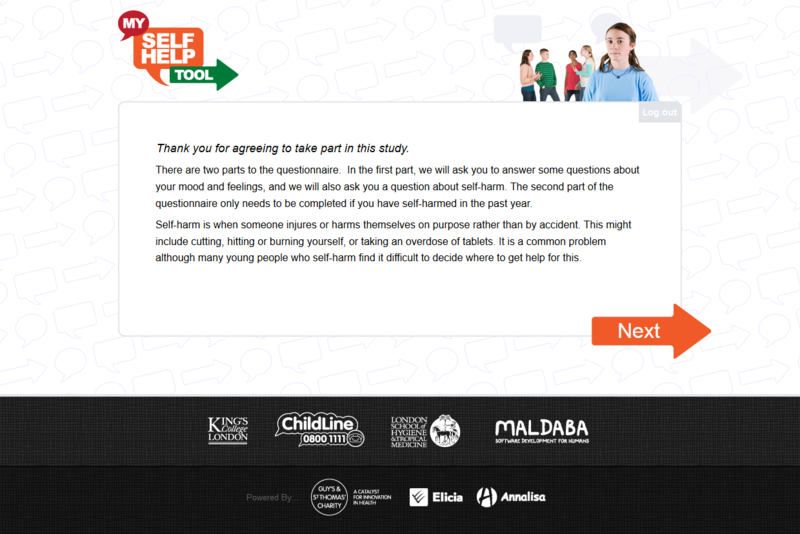 My Self Help Tool – Maldaba Ltd.
Maldaba were technical partners on an exciting research project led by Psychiatrists at King’s College London to help young people at risk seek the right help for them to avoid self-harming. A friendly tool users by young people to find help-seeking routes, helping them to think through the right actions for them. The project, funded by Guy’s & St. Thomas’ Charity, focussed on providing a software solution to young people at risk of self-harm, to help them make better informed choices about the right place for them to seek help and avoid self-harming. They go above and beyond in terms of thought and help that they put in to a project. They feel as invested in the project as the rest of us. I absolutely would recommend Maldaba, they are very sensitive to the NHS context. 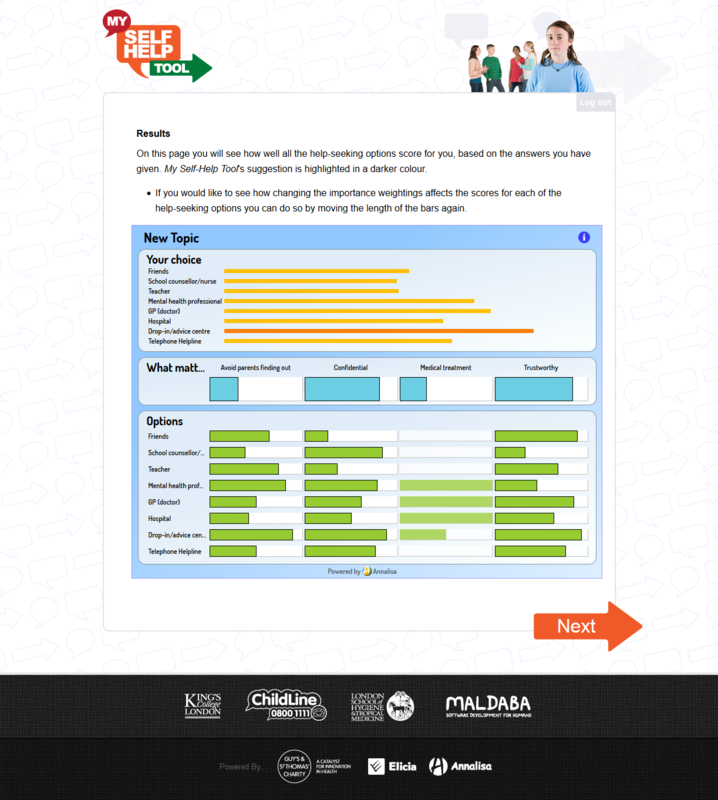 Named My Self Help Tool, the solution used two pieces of Maldaba software: Annalisa, our Multi-Criteria Decision Analysis tool; and Elicia, our online questionnaire builder. The two software fully integrate, providing a powerful, personalised platform for individuals to make decisions about a range of choices in front of them, based on that individual’s circumstances and preferences. I’d highly recommend Maldaba. They have the ability to talk very plainly about complex technical matters, with patience and commitment. In addition to providing the technology, and supporting its use in the research, Maldaba provided the randomisation software and monitoring tools, and delivered a website to house the project targeted at young people. Maldaba supported the project throughout the lifetime of the research, collaborating with researchers to help get the most out of their interactions with young people. 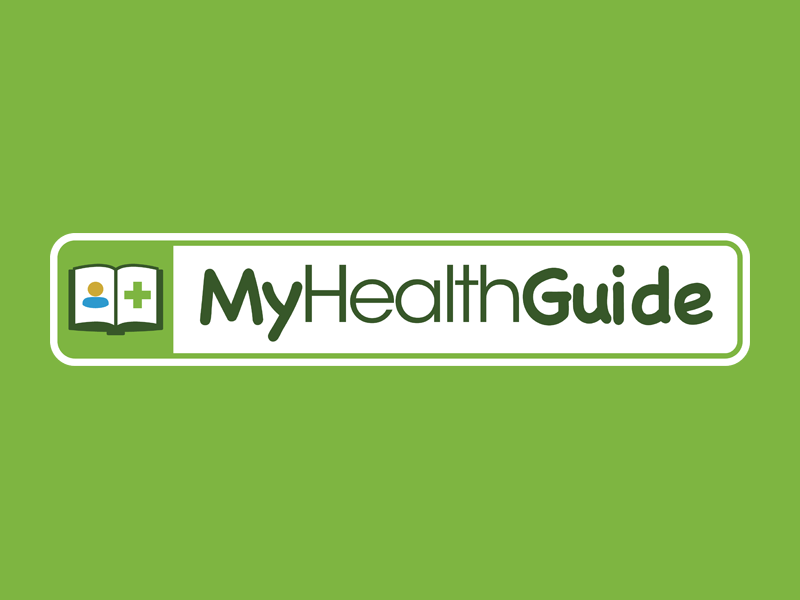 Get in touch with us to find out for yourself how we can help your organisation with decision analysis or randomised controlled trial projects.